Drywall is a construction material consisting of thin panels of gypsum board. The board is composed of a layer of gypsum rock sandwiched between two layers of special paper. Drywall makes for a much more efficient method of construction than the common earlier technique of applying wet plaster to a gypsum lath. In addition to being easy to install, drywall provides a measure of fire protection to buildings. Gypsum contains large amounts of water bound in crystalline form; 10 square feet (1.0 sq m) of gypsum board contains over 2 quarts (2 1) of water. When exposed to fire, the water in the gypsum board vaporizes; the temperature of the panel remains at 212°F (100°C) until all of the water is released, protecting the underlying wood framework. Even after all of the water evaporates, the gypsum itself will not burn and continues to provide substantial fire protection. Plaster made from gypsum has been used as a construction material for thousands of years. In fact, plaster applied at least 4,000 years ago to walls inside the Great Pyramids of Egypt is still in good condition. Today drywall panels are widely utilized in modern construction around the world. The primary component of drywall is the mineral gypsum. It is a light-density rock found in plentiful deposits worldwide. Each molecule of gypsum (or dihydrous calcium sulfate) is composed of two molecules of water (H 2 0) and one of calcium sulfate (CaSO 4 ). By weight the compound is 21% water, but by volume it is nearly 50% water. Because the water present in gypsum is in crystalline form, the material is dry. Although ice, another form of crystalline water, becomes a liquid at room temperature, the water bound in the gypsum molecules remains solid unless it is heated to 212°F (100°C), at which point it changes to a gaseous state and evaporates. Gypsum, called gypsos by the ancient Greeks, is one of the most useful minerals known to man. In its pure form it is white, but impurities often give it colors like gray, brown, pink, or black. Ancient Assyrians called it alabaster and made sculptures from it. Today, pulverized gypsum is used for a wide variety of applications. It is an ingredient in some brands of toothpaste and is used as a filler in products such as paint, cosmetics, and drugs. Automotive window glass is secured in a bed of gypsum while it is being polished. Gypsum is applied to farmland as a fertilizer and soil conditioner. An excellent source of calcium, it is used to fortify foods such as breads. It is even used to create simulated snowstorms in motion pictures. Gypsum that has been crushed and heated to remove 75% of its water content is known as plaster of Paris. When water is added to this fine white powder, the resulting material is easily molded into any desired shape. Upon drying, the reconstituted gypsum regains its rock-like qualities while retaining the desired shape. Besides its use in making gypsum board, this material is used to make sculptures, pottery, dishes, bathroom fixtures, and casts for broken bones. In its pure form, gypsum is white, but impurities often give it colors like gray, brown, pink, or black. Gypsum that has been crushed and heated to remove 75% of its water content is known as plaster of Paris. When water is added to this fine white powder, the resulting material is easily molded into any desired shape. Millions of tons of gypsum are mined each year in North America, and gypsum board is the principal product in which it is used. Besides the newly mined material, up to 20% of the gypsum used to manufacture drywall can be recycled from waste generated at the manufacturing plant or at construction sites. Gypsum produced as a byproduct of the flue-gas desulfurization process at electric power plants provides an economical, environmentally sound raw material for making high-quality gypsum board. Two types of paper are used in the production of most drywall, and both types are made from recycled newspaper. The ivory manila face paper, when properly primed, readily accepts most paints and other types of wall finishing products. The gray back paper can be laminated with aluminum foil to produce a special type of drywall that resists the flow of water vapor in environments like bathrooms. Specialized varieties of gypsum board might be made with different types of paper; for instance, some papers are made to be moisture resistant to various degrees, while another type of highly absorbent paper is designed to accept a thin coat of plaster veneer after installation. Fabrication of drywall consists of placing the gypsum core material between two layers of paper, drying the product, and finishing it into panels of standard size. 1 Depending on the variety of wallboard being produced, certain additives are blended with the plaster of Paris that will form the core of the drywall. Each additional ingredient amounts to less than onehalf of one percent of the amount of gypsum powder. Starch is added to help the paper facings adhere to the core, and paper pulp is added to increase the core's tensile strength (resistance to lengthwise pressure). Unexpanded vermiculite is added when producing fire-resistant grades of gypsum board; in some cases clay is also added. 2 Water is added to the plaster of Paris mixture to form a slurry of the proper consistency. An asphalt emulsion and/or a wax emulsion is added to achieve the desired level of moisture resistance in the final product. A foaming agent such as a detergent is included, and during the mixing process air is entrained into the material. The finished gypsum panel will be over 50% air; this minimizes the board's weight and makes it easier to cut, fit, and nail or screw to the framing. Glass fibers are added to the wet core material when making firerated gypsum board. 3 The gypsum slurry is poured onto a layer of paper that is unrolling onto a long board machine. Another layer of paper unrolls on top of the slurry. The sandwich then passes through a system of rollers that compact the gypsum core to the proper thickness. The most common thicknesses are 0.37 inch (9.5 mm), 0.5 inch (12.7 mm), and 0.62 inch (15.7 mm). 4 Automated assembly lines in gypsum board plants range from 300-800 feet (93-247 m) long. As the drywall continues along the conveyor belt, the edges are formed. Various shapes of edges are possible, depending on the final use of the panel. Options include the traditional square edge, a tongue and groove type, tapered and/or beveled edges, and even rounded edges. 5 The face paper is wrapped snugly around each edge and sealed to the back paper. 6 By the time the edges have been shaped, the plaster core has set sufficiently for a knife to slice the continuous strip into standard panel sizes. The board, generally 48 inches (1219 mm) or 54 inches (1572 mm) wide, is usually cut into panels that are 8 feet (2400 mm) or 12 feet (3600 mm) long. 7 The panels are transferred to a conveyor line that feeds them through a long, drying oven. At one plant, for example, the gas-fired oven is 470 feet (143 m) long. 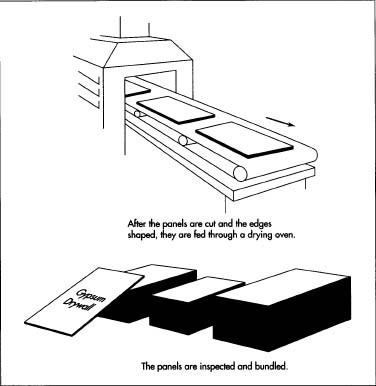 Panels enter the oven at 500°F (260°C) and are exposed to gradually decreasing levels of heat during the 35-40 minutes they travel through the system. Humidity and temperature are carefully controlled in the dryer. 8 After emerging from the drying oven, the dry wall panels are visually inspected before being bundled into "lifts" of 30 or 40 boards and transferred to the warehouse to await shipment. Each board is labeled with a UPC bar code that is used for warehouse inventory, billing, and price scanning at the retail level. Since the invention of gypsum board at the turn of the century, there has been gradual progress in making it lighter in weight while improving its performance characteristics. In the late 1950s, standard gypsum board (not fire-rated) weighed 2 pounds per square foot (9.8 kg per sq m); the various kinds of standard gypsum board now average about 1.6 pounds per square foot (8 kg per sq m). This not only makes handling and installation easier, but decreases shipping costs as well. Fire-resistant and moisture-resistant gypsum boards were developed in the late 1950s and early 1960s. Another innovation came in 1988 with the development of controlled density (CD) ceiling board. In this product, the core is compressed in such a way as to create thin, dense layers of gypsum on both sides of a standard density core. Although CD board is 0.5 inch (12.7 mm) thick, it is more resistant to sagging than conventional gypsum board that is 0.62 inch (15.7 mm) thick. Another area of investigation involves better ways of disposing of wallboard waste. During building construction drywall scrap is generated, both as trimmings from panels cut to fit required shapes and as damaged panels that cannot be used. An estimated 1.7 million tons (1.5 billion kg) of gypsum board waste material was deposited in land-fills in the United States in 1990. Research has begun in the area of pulverizing this material and using it as a soil treatment rather than simply discarding it. It appears that the effects are very similar to those achieved with gypsum products manufactured specifically for agricultural use. "TU Electric Pioneers FGD-Gypsum Production for Use in Wallboard." Power, April 1988, pp. 33-34. White, Edwin H. and Mark E. Burger. "Construction Drywall as a Soil Amendment." BioCycle, July 1993, pp. 70-71. Standing, H.A. "The Story of Gypsum." Domtar Gypsum Company, 1-800-DOM-TAR1. Hi, I would like to manufacturing gypsum board, could you help me, please?